Your map shows Lavender St. and Mount St. without a break in them, but I lived in 28 Lavender St, and I can remember a twitten linking the streets together. Does any body remember the Brewery that was in Lavender Street called Hedges and Hedges? Also there was a barbers shop near the bottom owned by a Canadian called Eddie? Provost who had a son at our school. Grateful thanks from a descendent of folk from this area. I have been having so much trouble locating the streets. 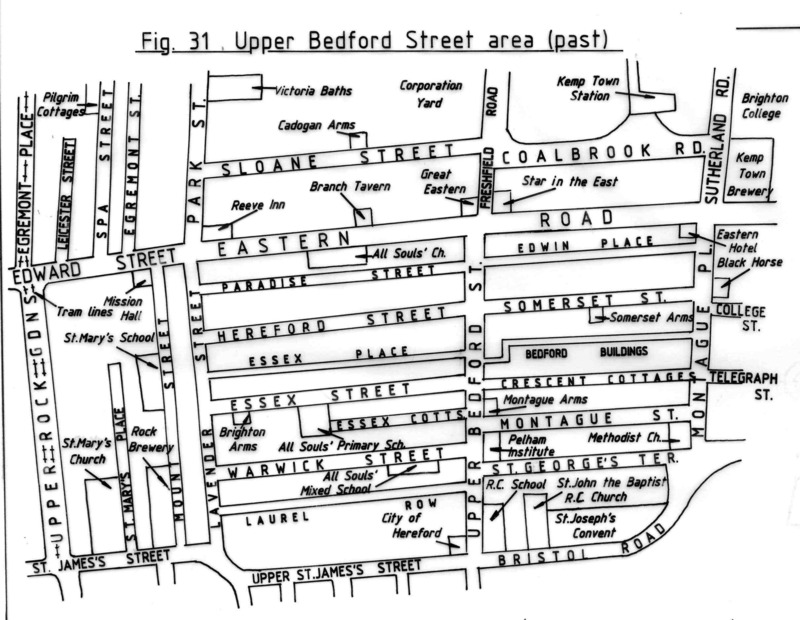 I have ancestors who lived in Mount St, Paradise St, Hereford St, Essex St, Bedford Buildings and Crescent Cottages. My great-grandfather’s house (14 Bedford Buildings) was bombed during WWII. Harry was correct about the twitten. I walk through there many times from Hereford Street to St Mary’s School in Mount Street. I think there were some garages on the corner of the twitten in Lavender Street. Sue, out of interest what were your ancestors’ names in that area? In the early ’60s, I lived in St George’s Terrace; my route to St Mary’s School was along Warwick Street, up Lavender Street, then along a small twitten to Mount Street. In the early ’60s there used to be a piece of waste ground behind the brewery near the twitten, it was used by Harmon plant hire. I remember often climbing over the fence and playing on the earth moving equipment which was stored there. Also there was a big malt house building at the top of Mount/Lavender Street which must have belonged to the brewery. Where was the mantle factory on this map? The map shows the ‘Star in the East’ pub at the NE corner of Eastern Road and Freshfield Road. Does anyone know when the pub was demolished? Is there a photo in existence? The ‘Cheeky Chappie’ Max Miller attended a charity event there in 1959 when he pushed over a pile of pennies. The licensee at that time was Mr Ward. Edwin Place had a rusty old factory in it where my brothers, Pete and Steve and I used to play. The pub on the corner was the Eastern and the landlord’s name was George. On a Sunday there was a pianist called Dorothy and I used to stand with my father, Sammy, and listen. Dad was a saxophonist but through the day traded in leather and shoes via a company in Frederick St (near the station). When the houses in Eastern Rd had purchase orders put on them we moved to Craven Vale and the demolition started but I have some great memories from living in Eastern Rd. I remember going to St Mary’s voluntary primary school in the 60’s. My teacher was called Mr Gardiner and the head was Mr Owen! There was a lovely caretaker too but I can’t remeber his name. Very happy days – we used to walk down to St Mary’s church I think on Thursday mornings for a school service and over to Queen’s Park swimmimg baths for our weekly swim! Did you used to live in Craven Road next to the Edwards in 1926? You’re right about Craven Road but way out with the date. We lived there from 1968 and I remember you well. My brothers were Pete and Steve. Hi there, loving this website. Stumbled across it while I was looking for a picture of my old home. My father owned ” The Reeve Inn” on the corner of Park St and Eastern Rd before it was demolished. I also attended Queen’s Park and St Mary’s. I remember Phil Lambert and some of the other contributers. My memories of school are not as romantic, certainly not the happiest days of my life. Ironic really as I am a teacher now. I have searched everywhere for a picture of The Reeve and would be really grateful if anyone has one or memories of my family who owned greyhounds. George was my Granddad who owned the Great Eastern. If anyone has any pics of the pub it would be much appreciated. Struggling to find any on the history of Brighton. Hi Wendy. Was your maiden name French? If so I remember you well from St Mary’s and the Lambert brothers. I went on to train as a nurse and have lived in London mostly in adulthood but have returned to live in Bright now. My husband, John grew up in Lavender Street, went to All Souls School and then Park Street. He lived at No 21 and his Nan at No 42. He says the mantle factory was on the corner of Lavender Street and Hereford Street. Does any one have a picture of the old Reeve pub from Park Street/ Eastern Road in the 1950s? I lived with my family in Warwick Street in the early 1960s behind All Souls school. I think it was an all boys school and I think the factory in our road was a biscuit factory but not sure (was this correct, does anyone know?) Then we moved to 14 Hereford street, and went to Saint Mary’s.